Discussion in 'Model X: Interior & Exterior' started by Muzzman1, Mar 10, 2016. Has anyone found appropriate seat covers for the 2nd & 3rd row? We will be taking delivery in a couple weeks, and have a 2.5 yr old as well as an 8 month old. We'd like to preserve the leather from their sticky grubby hands until they are older. Do not use seat covers on Model X. Doing so could restrict deployment of the side air bags if an accident occurs. It can also reduce the accuracy of the occupant detection system. Indeed, remember, the sides of the seats all deploy airbags. But something that covers only the bottom of the seat (as someone else showed in another thread using bath mat material under infant car seats) should be fine. I plan to order the following for my metallic blue X when it gets closer to delivery. It isn't beautiful but will protect the seats and should not interfere with the seatbelts or airbags. I didn't know about the airbag thing though. Also, I suppose they would interfere with the ventilated seats as well. How did it work out? Did you order it? Thank you! Evannex has seat covers, and I believe they have cutouts for air bags. They also have YouTube videos on the install process which is involved. Yes, they work fine on the second row (6 seat MX), but do not fit on the 3rd row very well. 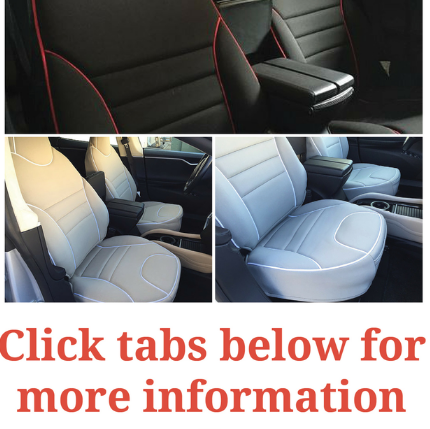 They are not form fitting, but reasonably priced, comfortable, easy to use, and match the blue car paint -- at 1/10th of the cost of the EVANNEX seat covers. I have 2 different ones that I put under my kid's car seats. One is rear facing at 2 yrs old and the other is forward facing at 5 yrs old. Both have worked GREAT to keep our seats clean and keep the car seats from indenting the leather.